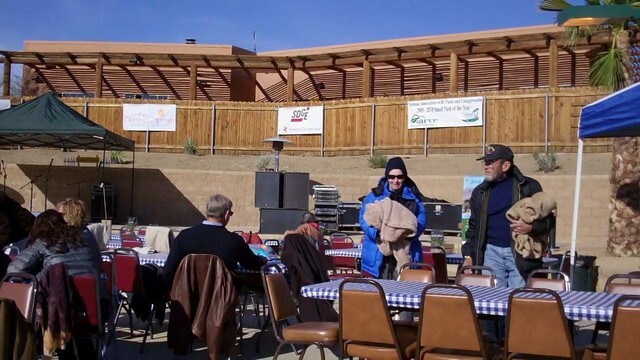 We are glad we stayed put here in Carlsbad, yesterday's weather on the local TV station north of here in Albuquerque indicated that they would get some heavy snow, the snow extended down to our area. It wasn't heavy but overnight the wind continued to howl and there was a noise of something hitting the side of the RV (perhaps dust??). Nope, it wasn't dust, it was blowing snow, this morning the windward side of the TV was caked with the stuff. At -6C at sunrise it was cold enough to stick but it's all gone now that we are up to a "balmy" 11C. The wind warning continues to 5:00 pm so it's an indoor day with the occasional walk to the dog park for Kasey, he's afraid of the wind so he prefers to be inside as well. We will pack up the few outside chairs today in preparation for leaving for Monahans tomorrow morning. 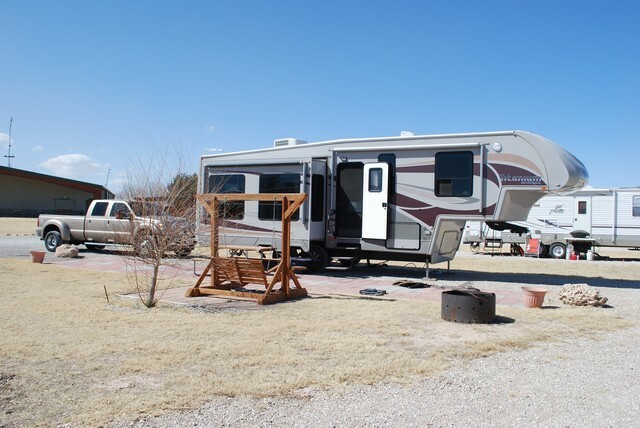 We arrived at the KOA here yesterday after the run from the Dreamcatcher RV park in Deming New Mexico where we stayed one night. 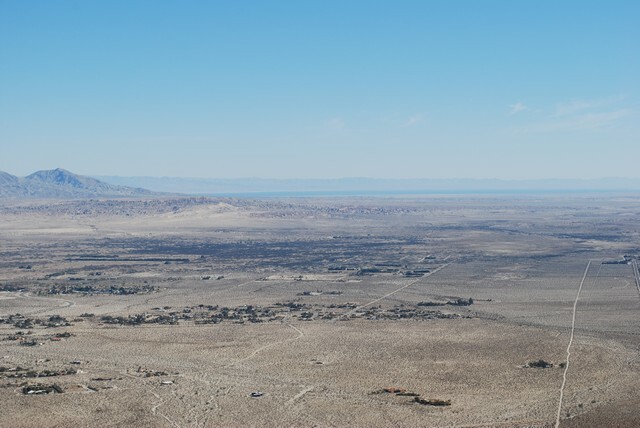 We decided to stay only one night in Deming as it was cool and we couldn't get into the state park. The run from Deming was uneventful, we got here around 3:30. We planned to stay here for two nights but we have decided to stay for an additional night as the wind has come up and the weather forecast indicates a wind warning through tomorrow noon with gusts to 60 MPH. This morning the wind was calm but the gusts started before noon. Our next stop is Monahans Sandhills state park in Texas and with the winds we would be "sand blasted" if we moved tomorrow. 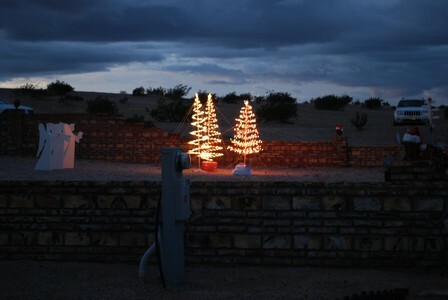 The weather has been strange down here this winter, Snow in Tucson, -6C overnight in Deming and very windy here. 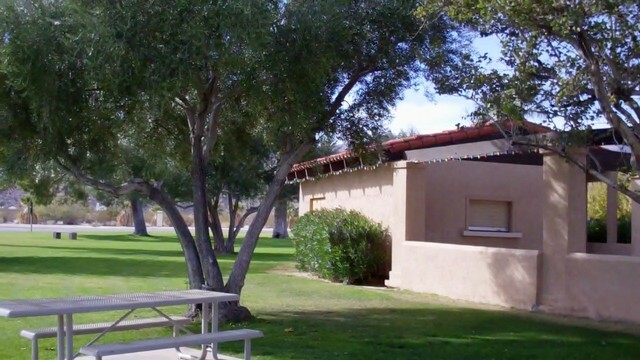 This KOA is a nice stop, it's highly rated by the RV reviews and we opted for a patio site as indicated in the picture below. In addition to a patio we have a swing and it's a wider site than the standard ones. They even make dinners and deliver them to you campsite (! ), we opted for a pizza last evening. 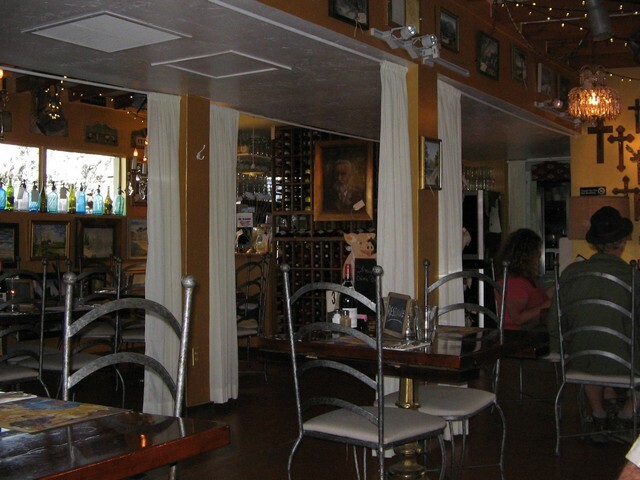 We will do some shopping in Carlsbad tomorrow to avoid the weekend rush and provision for a few days. 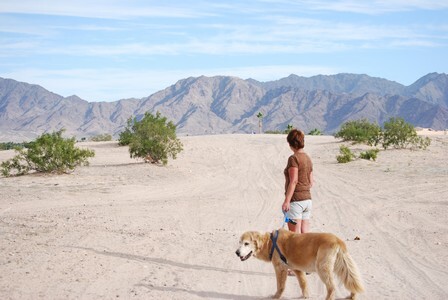 We have been here in Lazy Days in Tucson since Sunday, we move east on Friday. 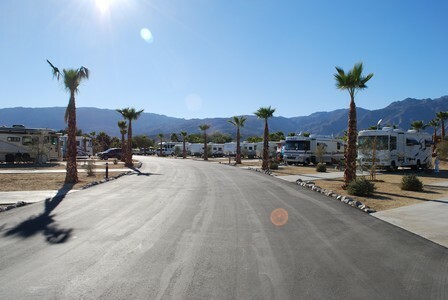 No additional pictures of the RV park as it's the same as in the pictures from previous years. There was a winter storm warning for today and it appears that the storm came through a bit early, the wind was howling last night (Al went out at 1:30 am to take down the satellite dish!). Today teh snow started falling before noon and the temperature dropped to almost freezing, it stopped mid afternoon but it's still cool. This weather system is headed east towards eastern Canada, look out for some tough weather! It's the first time we've seen any snow here. 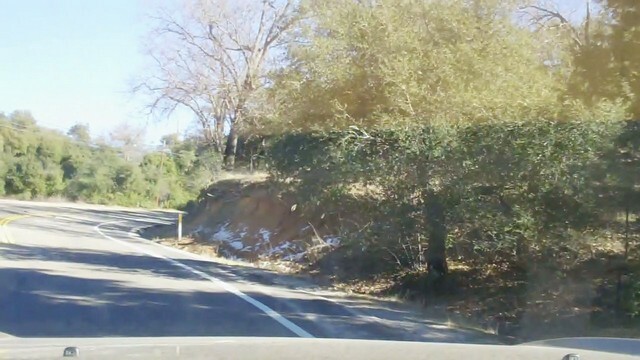 You can see the snow falling and that car in the distance is red in colour, not snow white! 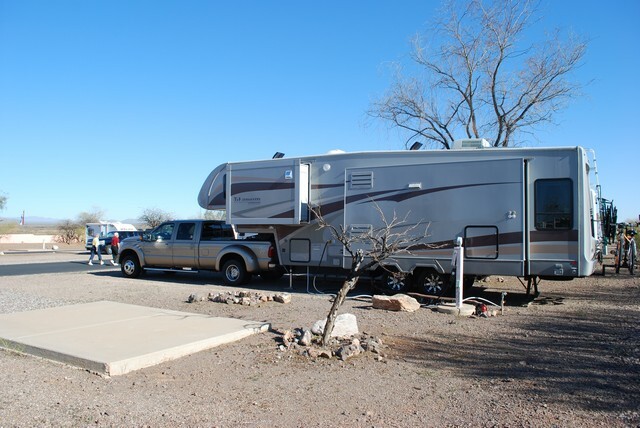 We left Yuma this morning and headed for Picacho Peak State Park, only to find that the campground was full. 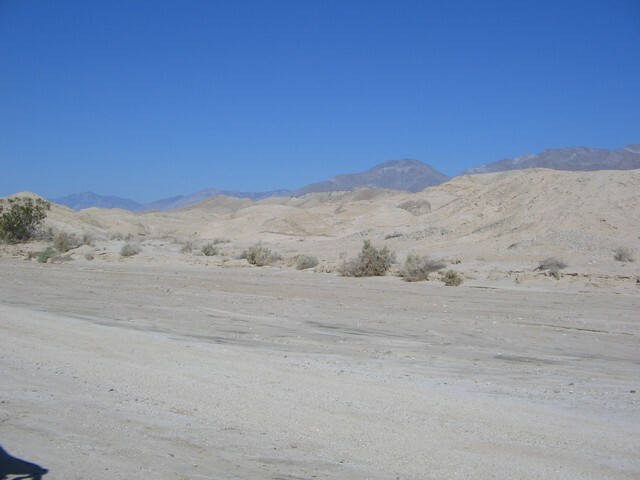 Apparently this weekend is a holiday (President's Day) and as a result the state park was full. 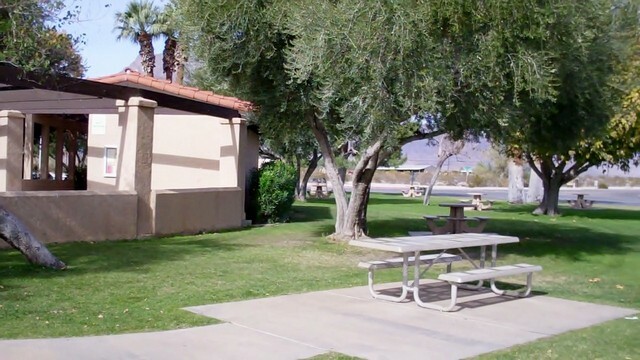 This park is about a half mile south of the state park and it has lots of spaces available so we are staying for one night. Just to be sure, Al checked for sites at Lazy Days in Tucson and reserved a site, just in case the place is busy due to the holiday weekend. 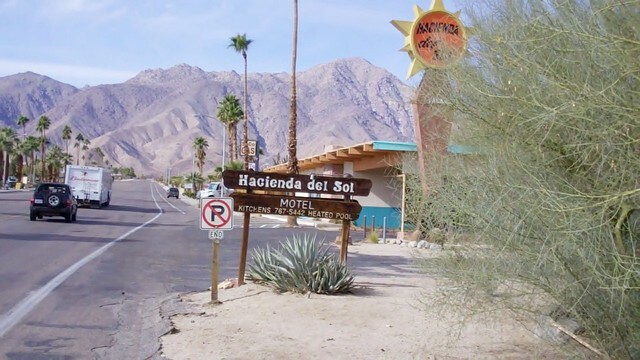 This place isn't bad, full services for $27.00 a night, the only problem is that it's close to I-8 so there is traffic noise, oh well! 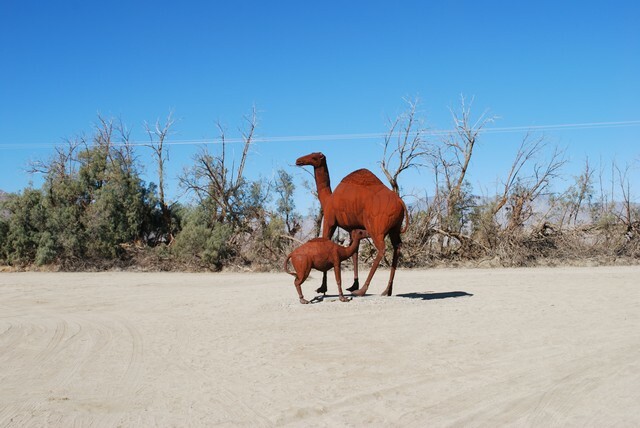 It was interesting to see Yuma in February compared to our stay back there in December, it was very busy! 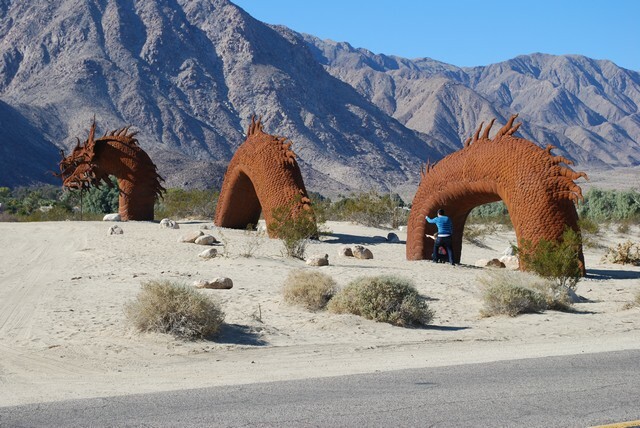 Maybe it was partially because we slowed down when in Borrego Springs, but it wasn't pleasant. The other thing that we noted was that Yuma was considerably "older". with lots of folks that were driving (but shouldn't be allowed to! 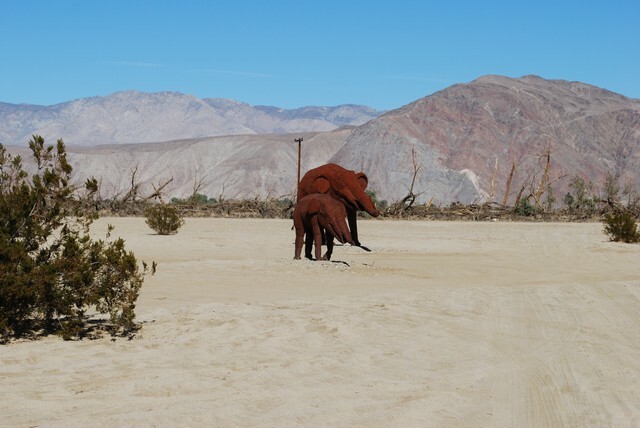 ), we noted a couple of close encounters and used our horn a couple of times to wake up drivers, our dually pickup apparently is too small to see! Al took a couple of pictures to document the park. 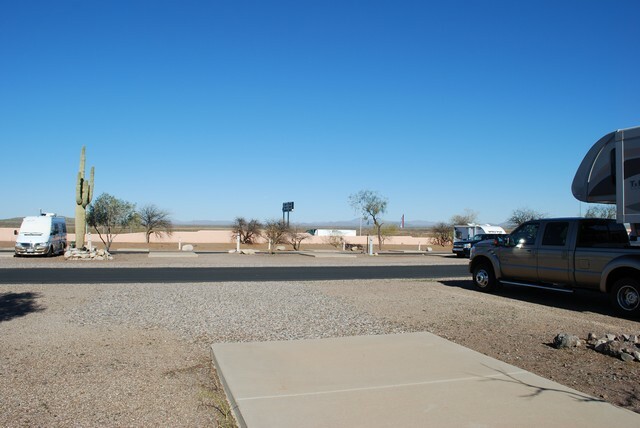 It has a combination of RV spaces plus there are are some manufactured homes, you buy a home (ranging from $30 to $50 thousand) and rent the lot ($2400 per year plus utilities). The water in the area isn't drinkable, there is a warning page that comes with the check in, apparently there are high nitrate levels and the note indicates that even boiling the water doesn't help, it makes the water worse because it concentrates the nitrates. The park has a reverse osmosis kiosk where you can buy drinking water, it's the same situation just about everywhere here in the south-west. We learned this lesson the hard way a few years ago when Kasey had a vet visit that cost a couple of hundred dollars. It's off to Tucson tomorrow! 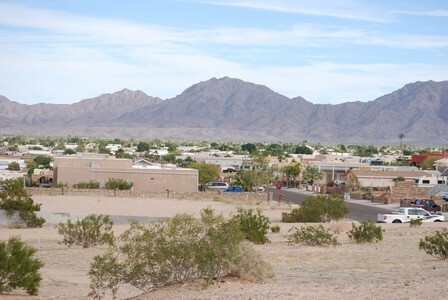 Today we packed up and headed for Yuma, we are in Westwind RV resort for 2 nights, it breaks up the miles to Tucson. We backed into the "tightish" site and did some essential shopping. We will do some more shopping tomorrow then head toward Tucson. We took a jeep ride this morning into the state park. 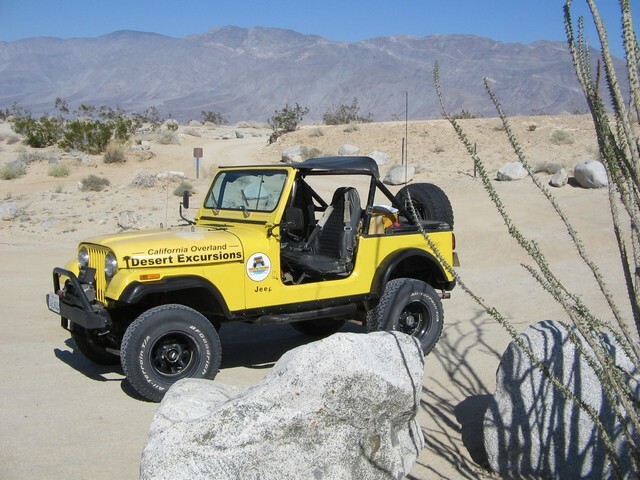 Desert Overland Desert Excursions is owned by Joe Raffetto, Joe took us in a modified Jeep CJ7 into the desert and provided some great information (and driving!). The jeep appears to be lifted and has the straight 6 engine and fuel injection (which didn't exist when the CJ-7 was built), it's the third engine in the vehicle so far. The company also has some ex-military 6X6 vehicles that take more passengers. 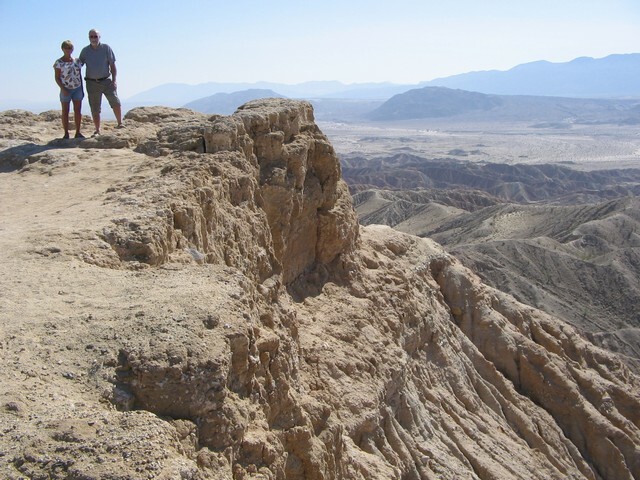 The Company provides a number of different excursions, both day trips and overnights. The jeep has a "bikini" top and comes complete with racing style shoulder harnesses. Suzette got the best seat in the back! Thats a trail down below behind Al! The tour comes highly recommended, we will take another one in the future! She didn't mind taking Al's picture! 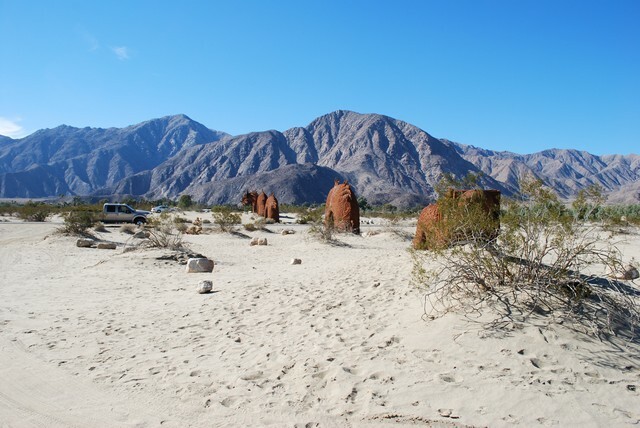 We are coming to the end of our stay here in Borrego Springs, tomorrow we take a private jeep tour in the desert! As you can tell, we are very relaxed and we haven't been posting. Our neighbour came by today to advise us that a fellow camper in the park had been accosted by a coyote while walking her dog in the park last evening. She picked up her dog and ran from the animal. We have been hearing coyote howls close by each night for the past few nights, I guess that the animals are hungry! 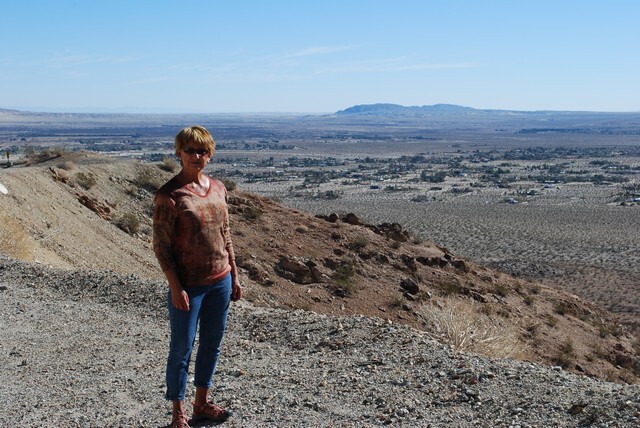 Tomorrow we take in a local french restaurant so Suzette can get some authentic mussels and later next week we may try a Jeep ride in the desert! Life is good. 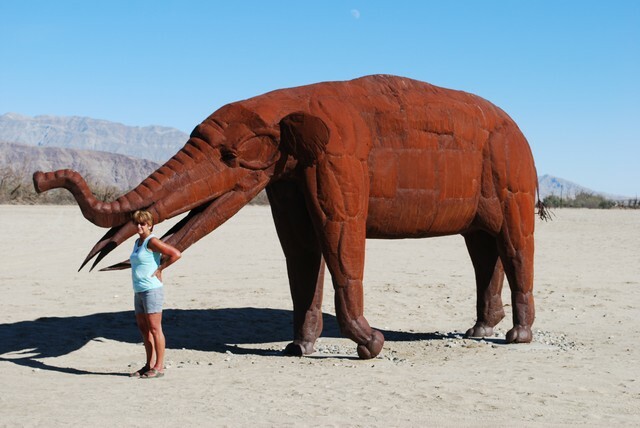 Yesterday we went out again to find the sculptures that we missed last time. We purchased a book that details all the sculptures and gives detailed locations. 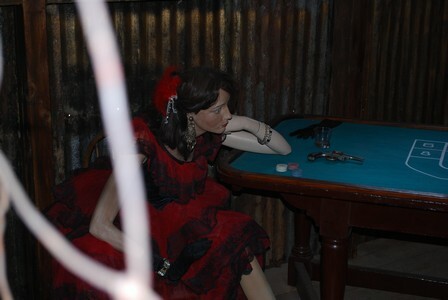 We also found out more information about the artist ( a Mexican) and the benefactor. The landowner where the sculptures are located is the late Dennis Avery (the heir to the founder of the Avery Label company). 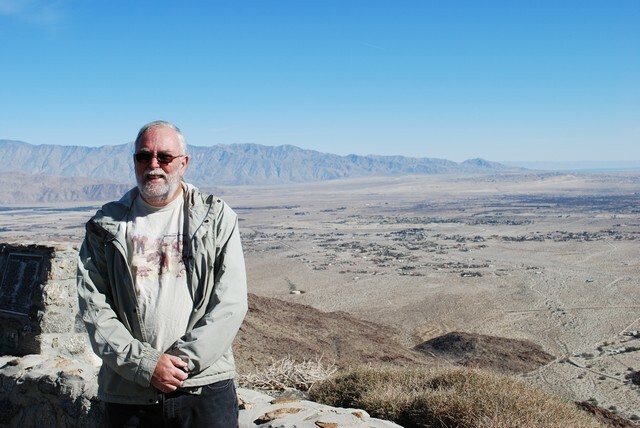 Dennis saw the artists work in southern California. 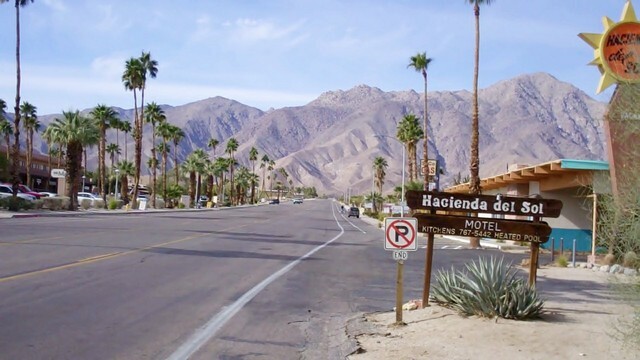 He lived in Borrego Springs with his family for a number of years and he decided to buy about 3.1 square miles (!) 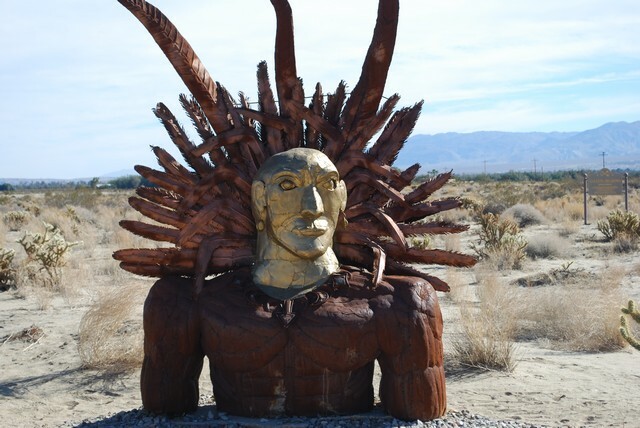 of various land blocks in the area when prices were low and have the sculptures made and erected. 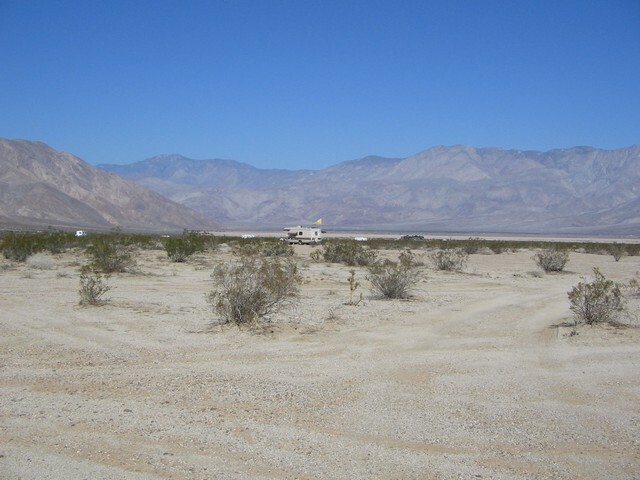 The land is open to visitors to drive on and boondock with campers. 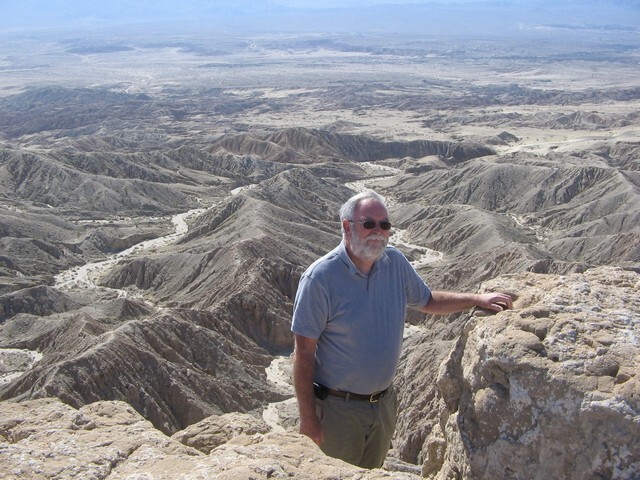 Dennis passed away in 2012 and in the local tourist guide the chamber of commerce is concerned about the future of the land and sculptures as a result of his death. 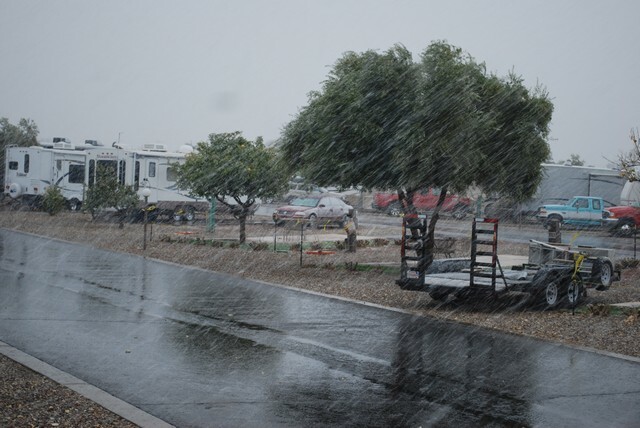 Today we have a very rare "rain day" here in the desert, it will clear up over the weekend. As you can tell, we've been relaxed and we haven't been posting. The daily temperatures have been increasing (it's 28C outside the camper) although it's still cool at night, the furnace has to run for about an hour in the morning to bring the temp inside up to 20C. 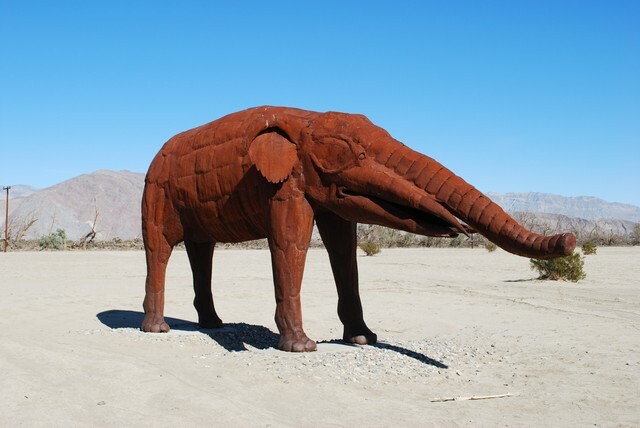 We were aware of some sculptures out in the desert, we've seen them on our way to Brawley. There are many more north of town and we did a short drive to capture some pictures. 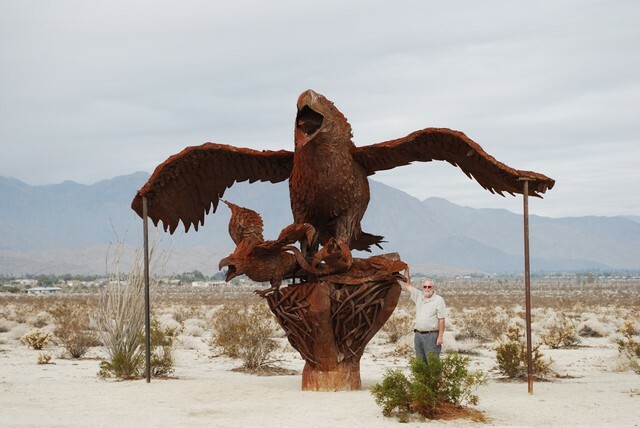 The sculptures are in steel and the details about the artist and the landowner who allowed them to be put on his property are on the LINK here. They are really quite big! We've gone over a week without doing a major shopping (and the supply of light liquid refreshment to stave off thirst has evaporated!) 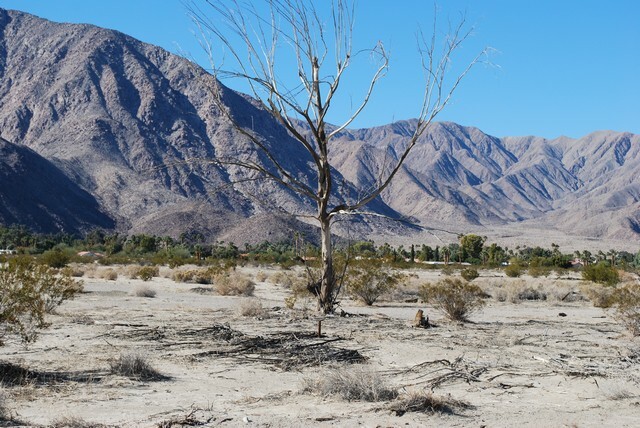 so we will drive to Brawley tomorrow. Al hasn't been totally relaxed, he's been beating his head on the desk with a DNS look up error problem (caused by Hughes, Brenda has supplied a possible solution) and trying to clone a hard drive for the laptop (software supplied in the kit doesn't work!!). Oh well, you need something to challenge you! Because the climate in the hills is more moderate (with more rainfall), it's ideal for cattle raising and orchards. It looks more like our climate back in Canada! No they aren't Italian opera singers, they are towns "up the hill" from our area. This time we didn't forget the cameras, below are some initial pictures of the drive, once Al reviews the video some more may be posted. 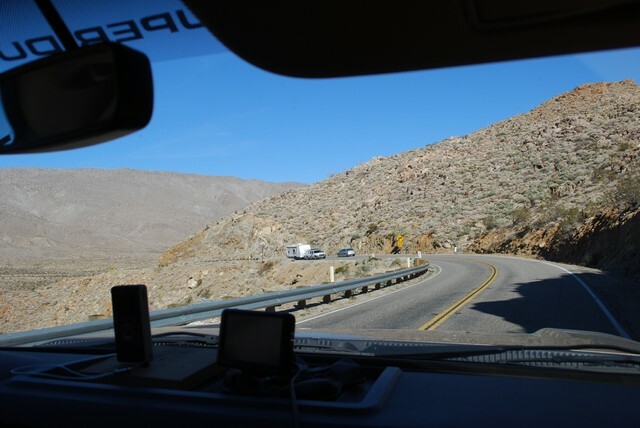 There were a number of RV's tackling the road, it would be interesting to check their temperature gauges! Some more pictures will follow! 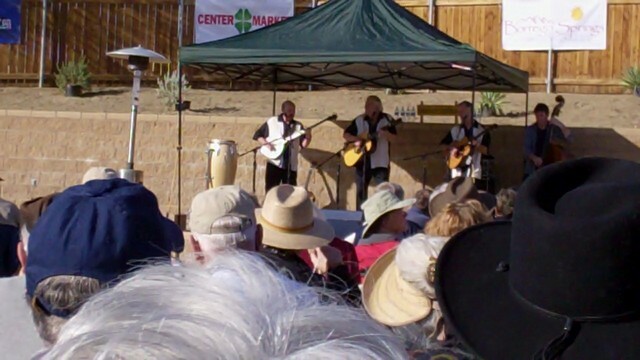 Yesterday we took in the Kingston Trio concert here at the resort. 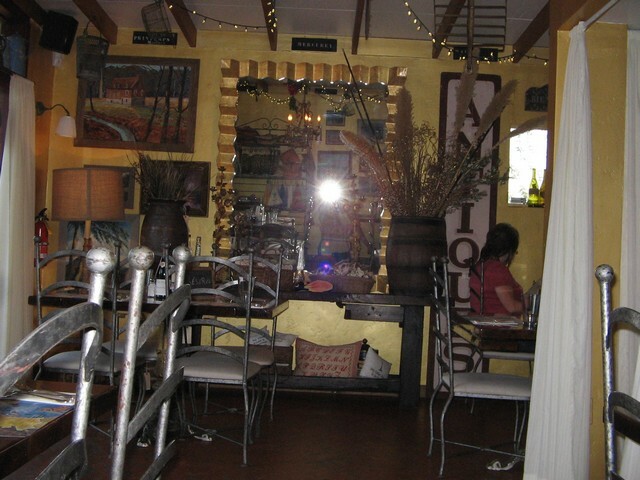 It was a fund raiser for a local non-profit and we enjoyed it. The trio are a little "old" for us and for our music tastes but we remembered some of their tunes and some songs by Pete Seger that they did. Some of the folks beside us (a bit older!) were singing all the songs word by word. We haven't been to an open air concert in a long time, getting "banded" brought back some memories of concerts in Toronto. The trio on stage, sorry for the hat in front of us! 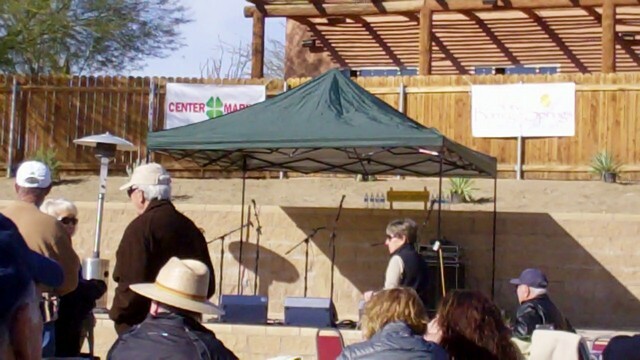 The Dreamcatcher amphitheater before the trio went on stage, it's a well designed outdoor venue, small enough that it's intimate. You can tell by the picture below that it's cool down here right now, cooler than in southern Ontario yesterday. People brought heavy coats and a couple actually had gloves and ear muffs. At concert time it was about 10 degrees C.
For folks wanting more information about the trio, this is a link to their website. Wikipedia also has some information at this link. 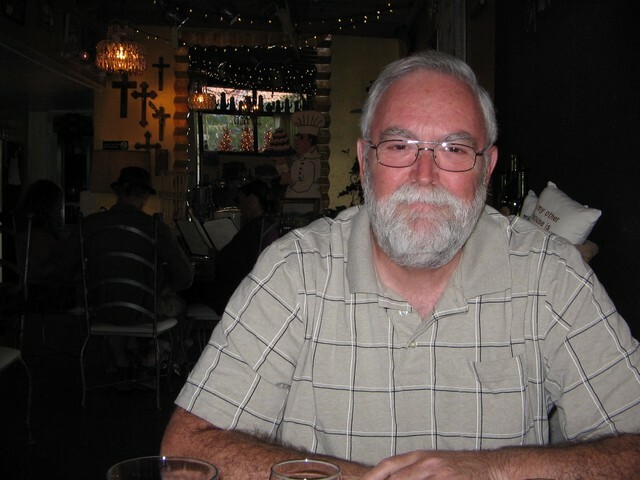 The only remaining original member of the trio is Bob Shane, he is covered in the Wiki page. He appeared at the concert and did one song, he is getting on in years as he went on stage with a portable oxygen inhalator. All in all, a great concert!! You can tell when we are relaxed at a location, no posting gets done! The bicycles have been unloaded from the RV and other than a short ride around the campsite they have been sitting. Today Al got ambitious and rode into town (not a long ride at 3 miles round trip). 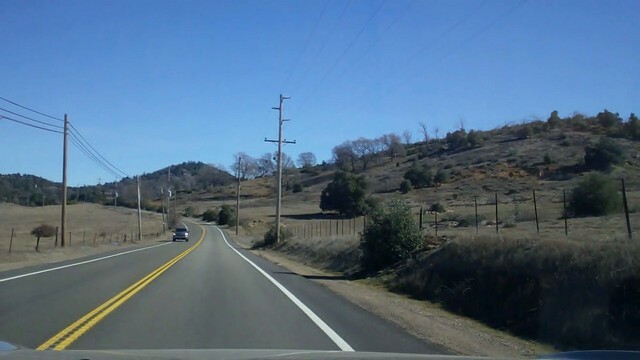 The beauty of the roads in the area is that they are quite flat, with any grades very gentle, and they all are wide with bicycle lanes, so there is no excuse not to ride. 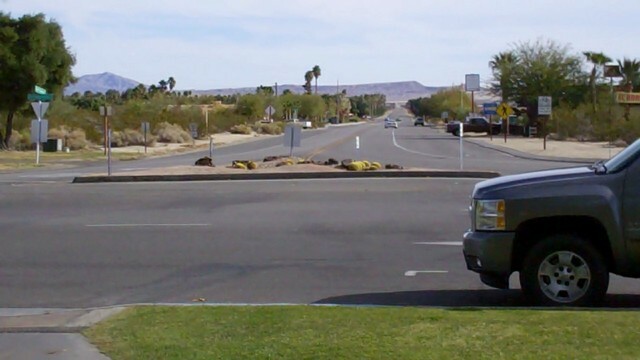 A view looking west down the main street, those are the mountains that we drove though last week! There is a traffic circle called Christmas Circle in the center of town that controls the county roads going through, there are some buildings and there is a farmers market held there on Fridays, we will try to take it in this week. 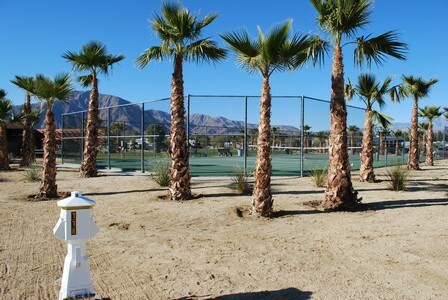 This is the view looking east from the Christmas Circle, the high palm trees in the distance (left-center) is where our resort is located. You can see how easy the ride is, the line on the roadside designates the bike lane, you can't quite see the line on the other side. More room for bikes than cars! 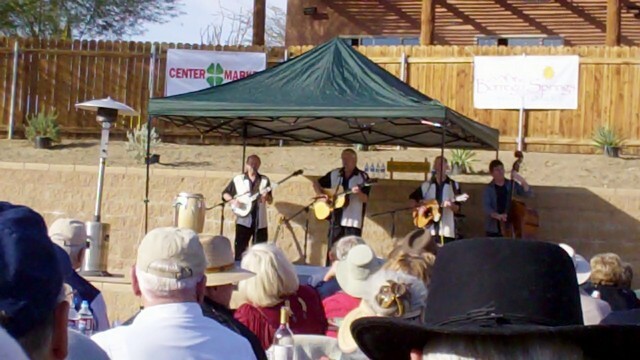 The resort is bringing the Kingston Trio in for an open air concert here in the amphitheater later in the month, at $10 per ticket it's a good deal, we plan to take it in. We've had a couple of days of warmer (26 degrees C) weather so Suzette has being enjoying the pool. Al may even try it (or the hot tub!). 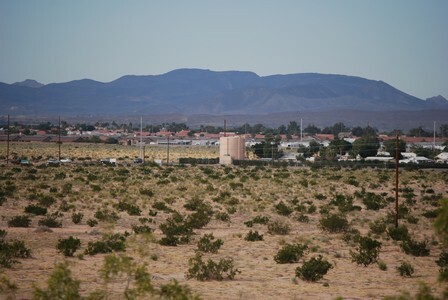 Yesterday we made the trek to Brawley to do a major shopping, it's a 100 mile round trip but it's a great drive. Today we decided to do some local driving. It's something we didn't do last year, this year we have more time to look around. Unfortunately Al didn't take a camera (always happens when we see the best stuff!) but we will do a re-run and take some pictures. 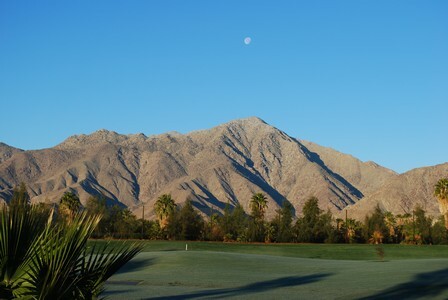 We went to the state park office here in Borrego Springs and bought a book that outlines some great drives. 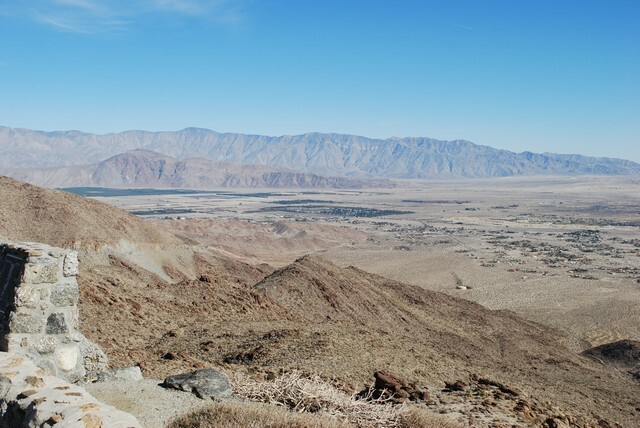 We then did a circle route to the west then back into Borrego Springs and the scenery was fantastic! 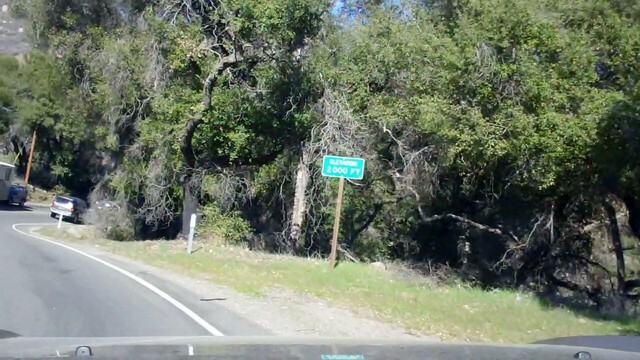 The road took us up into the mountains climbing an estimated 3,000 ft. or so then back into town. 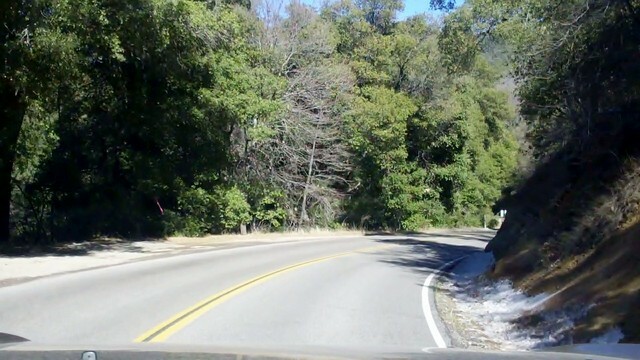 Lots of switchbacks at 20 MPH, there were guardrails and substantial drop offs. There also were a lot of motorcycles taking the route, it reminded us that Gary and Gillian would love to take this road on their Harley! We will need to gas up before we do some more touring, here in California the folks take a hit with taxes on fuel. The local price here for diesel is about $4.50 per gallon compared to $3.70 in Yuma. The lady at the state park office gave us directions to a station that has the lowest price in the area. Even in Brawley the diesel price is around $4.10 gallon. We have settled in, the stuff is unloaded and we are relaxed! We went into town and bought a few things and Suzette took an opportunity to hit the pool at mid day. There is a digital weather station sitting on the golf course fairaway here at the resort. I've posted a web link on the sidebar so the conditions can be seen. 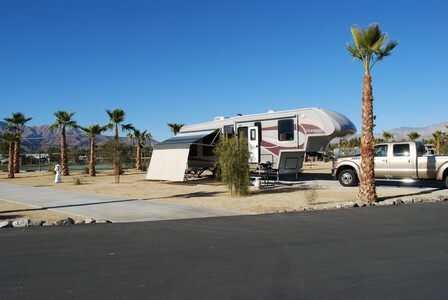 We have been in The Springs at Borrego RV resort since Sunday, we set up in a site awaiting the site that we reserved last year to become available, we moved over to the site this afternoon. We are here until mid February. The park folks have been very accommodating, we arrived earlier than planned and they shuffled other people's reservations on the site so we could have it early. The park itself is quite busy with local folks over the holiday, although today people started heading back home, lots of movement in and out of the park. That's frost on the grass, what you can't see is the snow on the nearby hills! Now that we are settled we will post some pictures and details! We spent part of the day packing up some of the stuff today, after a month in one location virtually all the stuff comes out, if you leave all the packing to the morning you leave it gets a bit stressful. So all the last minute pieces are still out but it will be a "normal" pack when we leave tomorrow. We decided to change our plans a bit. 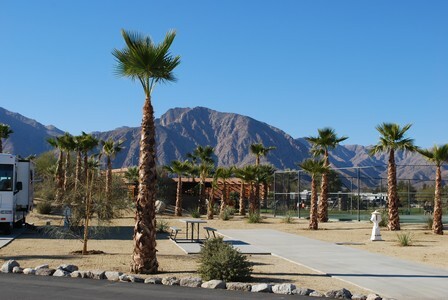 We had originally planned to spend a couple of weeks at the Fountain of Youth Resort and Spa, but they don't take reservations there so we faced the possibility of having to dry camp for a couple of days (it's still busy over the Christmas/New Years break) until we would get a good site. 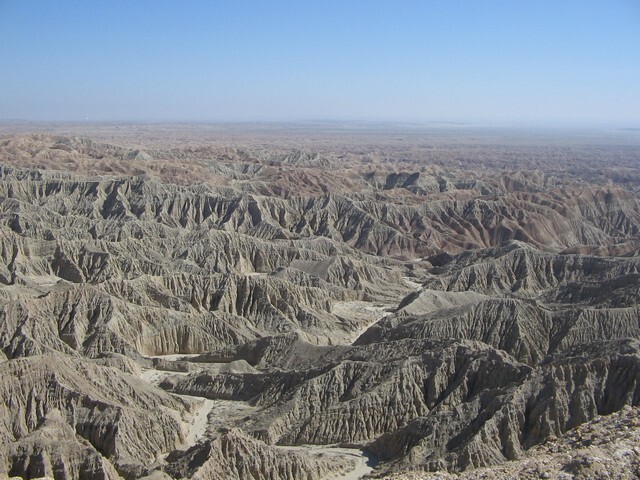 It's not worth the hassle, so Al decided to call The Springs at Borrego (where we are booked starting January 14 for a month) to ask if we could get in early. They pulled some strings (thanks!) 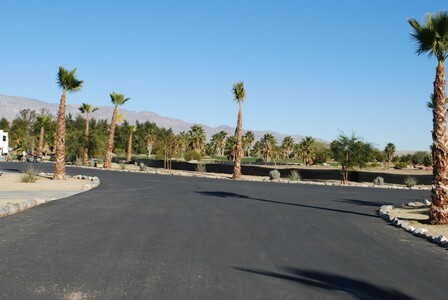 and moved the people who were destined for our reserved site on January first, so we park in another full service site tomorrow night and Monday night then we move to our reserved site on January 1 where we stay until mid February. 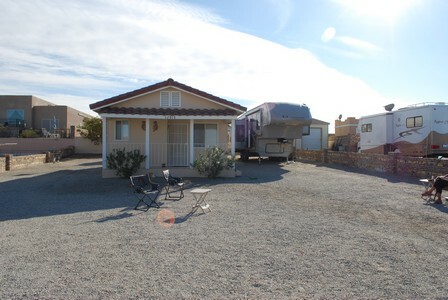 The stay here in Yuma this year has been great, we have been buisier than in previous years, the neighbours around us have been very friendly, we also have had the pleasure of the company of friends Don & Linda, Dennis and Carole and Gary and Gillian. We very much enjoyed their company and the meals we shared (Al's belt is out a notch!) and we look forward to seeing them again in the future. Al took a final picture of the RV in the lot, just to show that we actually have been here! 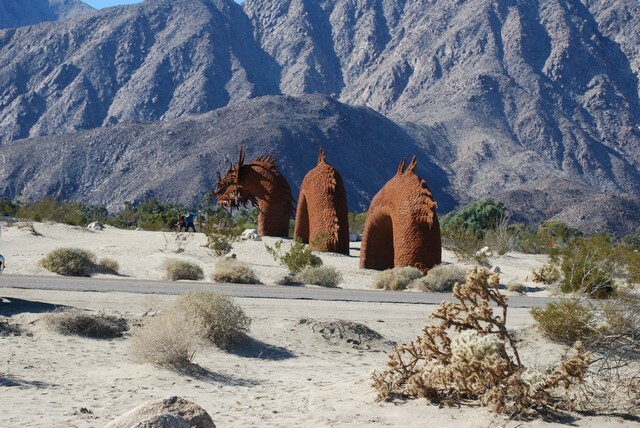 It only about 140 miles or so to Borrego Springs (and we gain an hour!) so it won't be painful. We also get to try out the new Awning! Kasey is looking forward to the dog parks as well. 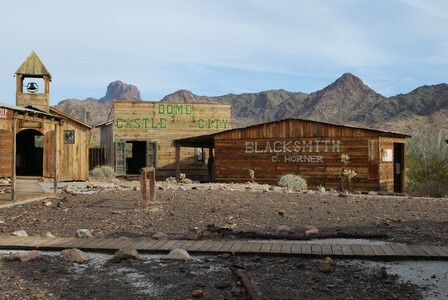 Gillian and Gary suggested that we take a run north from Yuma to check out a ghost town called Castle Dome, they have created a museum from this mining town. 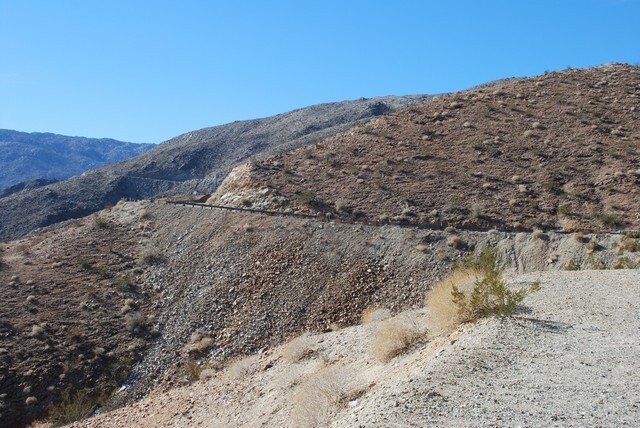 The area has gold, silver and lead deposits, each mineral was mined, including a lot of lead during the war years. 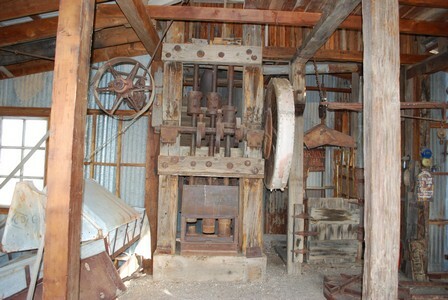 It was a good place to visit, many antiques and pieces of mining machinery, a great look into the past. 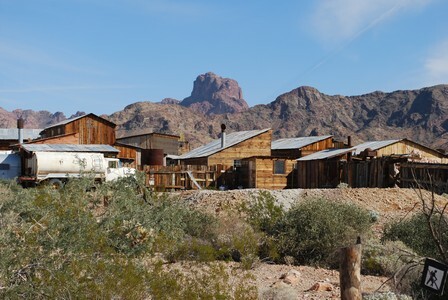 The mining stopped sometime mid 20th century but it had existed before the turn of the century. This machine seems to process the lead into ingots but Gary & I never quite figured out how it worked! 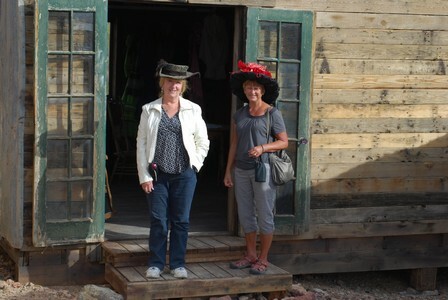 Gillian & Suzette found some interesting antique hats in the store! 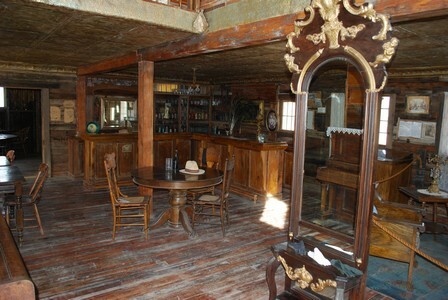 Another feature of the village was a brothel, one of the ladies in attendance! 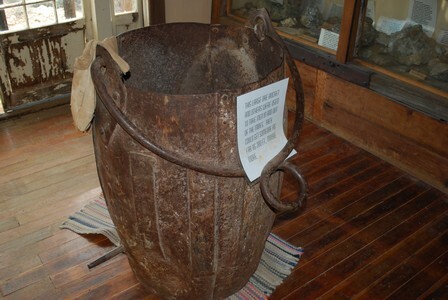 This is a ore bucket/transporter that lowered the miners into the mine, note all the safety features!! 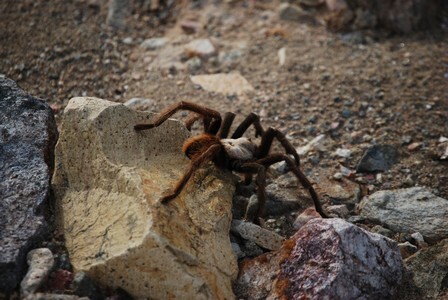 We ran into some wildlife, a couple of quails and this spider (a tarantula? ), the telephoto lens makes it look much bigger than it actually is! We had to rush a bit because we had to get back to the RV to release Kasey, the museum would take a full day to see all that's there. On the way back the front truck tire picked up something and it was completely flat when we got back to Gary & Gillian's RV. Gary worked hard to change the tire, Al just got in the way! Thanks Gary!! As a result "The plan" hasn't completely come together, a tire repair or replacement is needed before we move on into California. I'm not sure but I believe that this quote was made famous by George Peppard of The "A" Team fame. 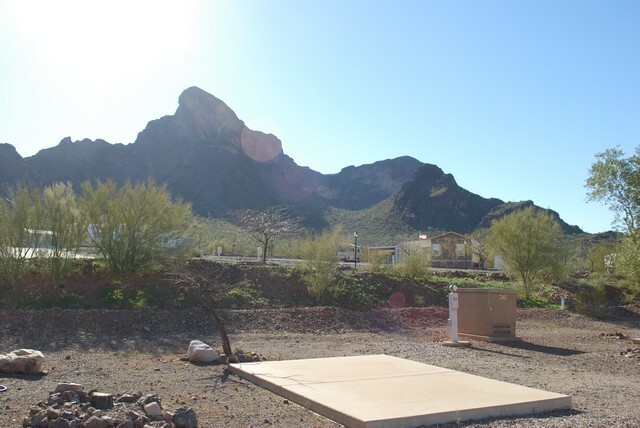 Things are coming together nicely, Al's eye infection has cleared up and the replacement awning has arrived in Yuma and will be installed on December 26. 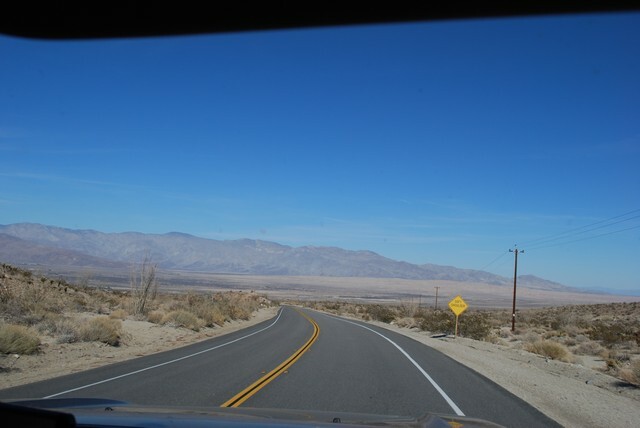 Everything is on track so that we can move into California in the new year. We have been enjoying the company of some friends, yesterday we had a great lunch with Don & Linda who we met in previous years in Mexico. Today we accompanied fellow Titanium owners Gary and Gillian to the Cloud Museum in Bard California. It's a great place to visit, every time you go there you learn a bit more about Model "T" Fords, this time it was details about the ins and outs of the Model T's planetary transmission. There were even a few Chevrolets and REO vehicles for Gary, a true GM fan! It was great to meet Don & Linda again, we shared some memories about Mexico and we talked about the Rio Grande Valley and the Texas Gulf Coast. It's been a little cool here for the past few days, hopefully it will warm up a bit so we can spend some more time outside. We have been relaxing and getting some exercise here over the week. Al went to an eye specialist to get some medication for his eye infection and is on the mend. 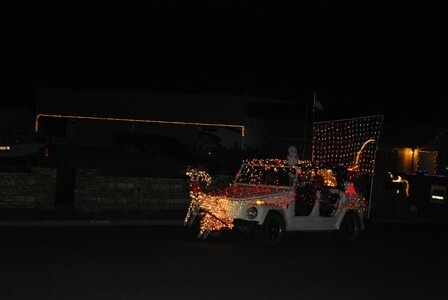 Last evening the foothills community had it's annual Parade of Lights, the folks get together to decorate their various vehicles and have a parade. 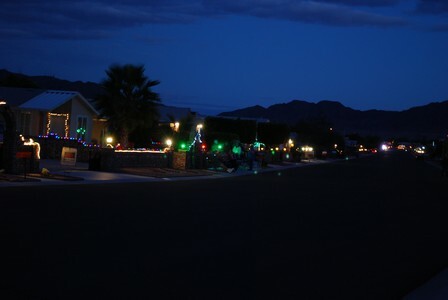 The street also had a get together where hot dogs and Chili were served, it was a good party from all reports. Our neighbours have been working hard on their decorations! 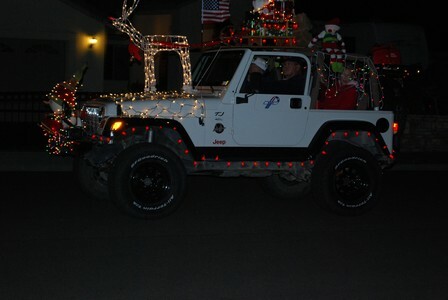 This Jeep is well decorated! 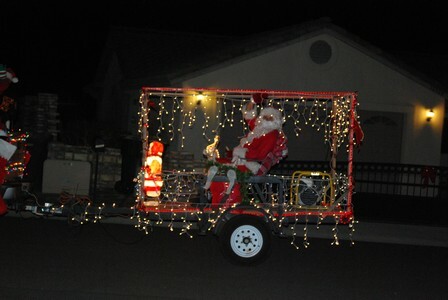 Santa with lots of lights around him! This VW "thing" hasn't been manufactured in 30 years, an ideal vehicle for the desert here! We are looking forward to meeting up with some Canadian friends next week. For the first time is a number of years Al got on the bicycle for a short run to get his legs (and behind!) back in shape, Suzette already has taken a ride or two. We are going out again this afternoon. 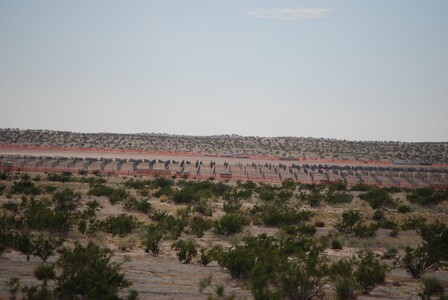 Yesterday we went "over the hill with Kasey for a long distance look at the solar energy facility being constructed on the public land here. 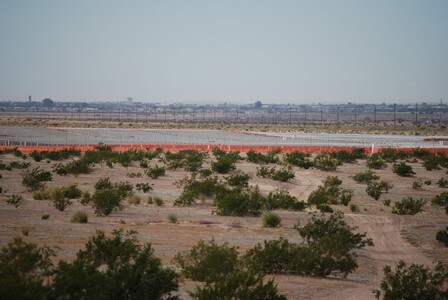 For interest, I have posted some web links below that give more information on the solar project. The US takes energy sufficiency quite seriously!